It can’t be denied that Keurig and Nespresso are the two juggernauts of the pod coffee machine world. Both are two well-renowned and reputable brands, and many times, it’s a toss up like Apple vs PC when it comes to Nespresso Vs Keurig. Is Nespresso better than Keurig? 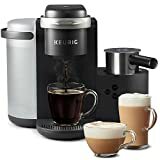 Is Nespresso compatible with Keurig? Does Nespresso have more caffeine than Keurig? To make things simpler, I am going to divide the in-depth comparison into various sections of things that are important when considering a coffee machine, and I’ll attempt to present Nespresso Vs. Keurig side by side. Keurig machines, at heart, are single-serve coffee makers. You put a pod in, fill the tank with some water, and press the button – and the machine produces a perfectly brewed single cup of coffee. Neat, right? It doesn’t stop there, though: Keurig machines have a giant variety of pods – as well as pods made by other companies – so there are tons of different blends you can try. If you want a break from coffee altogether(I don’t know why someone would, but hypothetically speaking) you can even opt to get non-coffee pods. These include hot chocolate, teas, and fruit-based drinks. The variety is nearly endless with Keurig machines – though the type of coffee it brews is not an espresso, it’s actually a regular single-serving of black coffee. Nespresso machines, as the name may suggest, are espresso machines that use proprietary pods made by Nespresso themselves to brew single shots of espresso with a handsome layer of crema on top. There also lungo shots available with vertuoline which are essentially larger pods, so you get a larger amount of coffee – black coffee in this instance rather than the smaller espresso shot. Nespresso has two sub-brands of pods: Vertuoline and Originalline. There is a difference in the way each pod is brewed, and the flavors available are also a little different between the two lines. Keurigs are clearly the more flexible machines, having the ability to brew a LOT more variety of beverages than a normal coffee machine, but for espresso-only lovers, the Nespresso may be a more suitable choice. Without factoring in the cost of running the machine itself, we can do some math to see how much a Keurig would cost you per year and how much a Nespresso would cost you per year, assuming you drank one cup of coffee per day. There are a wide variety of Keurig K-Cups(5 to be precise) and the different K-Cups brew different amounts of coffee. For example, there are larger K-Carafes which brew large amounts of coffee in a single go, ideally for commercial settings or large households. Nespresso, like noted above, only has two types of capsules at this point: Nespresso VertuoLine and OriginalLine. Assuming you drank one cup of coffee per day, for one year, an OriginalLine machine would cost you $292. A VertuoLine machine would cost you $419. To compare, picking up a $3 coffee at a local coffee shop every day would cost you $1095. That’s still saving over $700 per year with OriginalLine, and over $600 per year with VertuoLine. Keurig has 5 different kinds of pods, and the compatibility varies with the type of machine. Clearly, Keurig has an overall advantage in terms of money value per cup. However, you may be an espresso or cappuccino person like me, and you would much rather prefer a nice foamy latte or cappuccino rather than a mug of black coffee – in which case the slightly higher cost of ownership for Nespresso machines would be justified. The brewing method of Keurig and Nespresso is quite similar. Both machines use pressure and heat to extract the flavor from the coffee(or beverage) grounds into water. However, Keurig machines can brew a cup of coffee in just about a minute – that’s a lot faster than any other machine out there. Nespresso does brew the “finer” beverage, though. Nespresso coffees have been reported to be more authentic and flavorful than Keurig coffees – but both are still better than typical drip coffee. As for build quality, Nespresso is the clear winner. Nespresso machines are made in Switzerland and they are made with better quality plastic than Keurig machines. Keurig machines are made in China. They don’t take any shortcuts on their materials, for sure, but the higher Nespresso price point is due to the fact the use more plastic and metal in their machines than other manufacturers. As such, you get what you pay for – the costlier Nespresso machines are definitely more durable than Keurig machines, plus they have a 2 year warranty you can fall back on should something go wrong. Keurig, on the other hand, has a 1 year warranty. Keurig has over 55 models to choose from – each ranging in price, brewing capacity, and more. At the very core, though, all Keurig machines are designed to brew beverages from the K-Cup pods. The large variety definitely means there is a wide price range and something for every budget. You can pick up a Keurig for less than $100 all the way up to a commercial model well above $500. Which brings me to the fact that there are indeed commercial Keurigs available. Many offices and workplaces have Keurig machines that have large tanks(so you don’t need to keep refilling) and are able to brew hundreds of beverages a day very easily and in large quantities, too. Nespresso has a much tighter – or exclusive, depending on how you look at it – line of coffee makers. Some of there machines are name-brand Nespresso machines, whereas others are made by licensing their method out to companies like DeLonghi. Some Nespresso machines also have very nice built in frothers to make lattes and cappucinos. As far as I have done my research, I don’t think there is a truly “commercial” model of Nespresso machines out there at the moment – most Nespresso machines are geared towards home use. Keurig is definitely the winner as far as variety goes. There are far more models to choose from and they are suited to a much wider range of budgets. Keurig is definitely very, very flexible. It’s not limited to just being a coffee machine. With a Keurig, there are hundreds of different kinds of beverages that you can brew, from coffee, to hot chocolate, to teas, to fruit-based drinks. A large number of manufacturers support Keurig and make their own K-Pods with their own name brand coffee(Starbucks and Maxwell house for example), so there is really something for everyone with a Keurig. Especially if you are generally loyal to and enjoy Starbucks brand coffees, you can continue your patronage of Starbucks coffee with your Keurig by using Starbucks pods. Additionally, some Keurig machines are compatible with a reusable K-Cup that you can fill in with any kind of ground coffee – or other beverage powders – that you like, reducing the cost of your K-Cups and reducing your environmental footprint, too. I remember my dad had Keurig which he used some pods for every now and then, but most of the time, he used his favorite brand coffee which he had been drinking for a long time with the reusable mesh pods. A Nespresso machine is kind of like buying an Apple device. Once you commit to the machine, you’re stuck in their proprietary ecosystem. That’s not necessarily a bad thing, as their coffees are indeed very good, it just means that you’re stuck using their own products and are limited to the kinds of coffees they sell. There are jerry-rigged reusable pods for the OriginalLine machines, but they’re aftermarket solutions at best and not exactly very ideal. As you can see, it’s by no means a limited selection but it’s still smaller than the huge variety available with Keurig machines. Finally, the big question! Which machine is easier to maintain? Descaling the water tank with a water/citric acid solution every 6 months. However, if we were really going to put it to a head to head comparison, Nespresso machines are slightly easier to clean because they have less outside moving parts than Keurig machines, in which there are more parts, and they have a tendency to get more fiddly, too. Coffee pods are disposable by nature, and every time you drink some coffee from a pod machine, you’re generating some non-biodegradable trash. Is that a game changer for you? Only you alone can take that decision. However, both Keurig and Nespresso are aware of the huge environmental footprint they have created and are actively working towards making their machines more eco-friendly. Keurig aims to make all their pods fully recyclable by 2020, and Nespresso has already set up a decent infrastructure of recycling centers in their own stores and participating retail stores where you can drop off or send your used pods for recycling. Nespresso or Keurig: Which is better? The answer to the question of Nespresso or Keurig(and which is better of the two) is very subjective and very dependent on your personal preferences. However, if I were to sum it up, Nespresso machines indeed do brew far superior espresso shots than Keurig machines do. But that’s about the only factor in which the comparison is clear-cut. After that, things get dicey – Keurig machines have far more variety and flexibility, while with Nespresso, you’re locked into their ecosystem. As far as cost, both Nespresso and Keurig compare quite similarly. There are expensive and cheap machines available from both companies, though as we saw above, Nespresso pods can get quite expensive. Go for a Nespresso machine if you’re likely to have espresso shots most of the time. If however you prefer lungo shots or normal brewed coffee, go for the Keurig, as you can also enjoy the occasional tea or hot chocolate with it, too. Nespresso pods are not compatible with Keurig machines, and Keurig pods are not compatible with Nespresso machines. I wish there was some magic one size fits all pod that did indeed fit both machines, but sadly that’s not meant to be(as of now, anyway). Nespresso pods and Keurig pods are shaped completely differently – so while the contents may be relatively similar, there’s just no way you can physically fit a Keurig pod into a Nespresso machine or a Nespresso pod into a Keurig machine. Keurig K-Cups brew a full 8 fl. oz size cup of coffee, so they contain quite a bit of caffeine: about 100 mg per serving. Keurig also makes Extra Bold K-Cups, which contain 30% more coffee grounds, and as a result, will contain about 130 mg of caffeine per serving. Keurigs are a little tricky to exactly estimate caffeine content for since there are so many varieties available(especially compared to Nespresso, where fewer varieties mean a more accurate average). Most of the Keurig machines we’ve talked about here are straight up coffee machines with no milk frother. Keurig’s answer to that is the Keurig K Cafe, which is the best of a Keurig plus a milk frother so that you can make proper cappuccinos and lattes. Well, as proper as can be – since Keurig still uses its own proprietary method of brewing from the K Cups, just topping it off with frothed milk. The difference of course will be that there is now a “Shot” button that you can press to brew a concentrated shot of coffee from your favorite K Cup pod, then you can top that off with frothed milk to make a cappuccino or an espresso. In the question of Keurig K Cafe vs Nespresso, I still think that it depends on how much flexibility you want. Obviously, you’re very limited when it comes to Nespressos, since you can only brew select kinds of coffees, you may not always have a frother, and there’s relatively fewer flavors available. However, Nespresso brews a damn good shot of espresso and the crema they produce is just glorious, so if you’re only into espressos, you can stick with a Nespresso machine. If you want flexibility – being able to brew pretty much any beverage you want, whether it’s an espresso, cappuccino, latte, or straight coffee, as well as teas and hot chocolate, you can’t go wrong with a Keurig K Cafe. Do you want an all-round machine that is capable of brewing a wide variety of beverages? Or do you want an espresso-specific machine that brews hella good espresso? If you’re the all-round type, go for a Keurig. They’re also better machines to have between a family, since your kids can have hot chocolate and you can also enjoy some tea every now and then. If you're the espresso type, go for the Nespresso. No machine makes espresso quite as good as the Nespresso does.